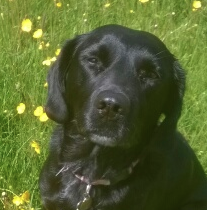 Pet of the Month for this October is Niamh, a delightful Springer Spaniel, Labrador cross. She first came to see us with her current complaint in the summer of 2014 with a history of vomiting and diarrhoea after possible ingestion of rhubarb. Blood tests showed Niamh to have developed renal failure and because of the unique and unusual nature of the presentation she was referred to a specialist. Further diagnostic work indicated ‘acute on chronic’ kidney disease – very unusual in a five year old dog, as she was then. Niamh has been the sweetest of patients with an extremely friendly, upbeat nature even when has been feeling very ill; despite the gravity of her illness she made great progress and was in remission until earlier this year when she started to deteriorate again. With appropriate treatment Niamh’s blood results have improved and we are hoping she may be back in remission again very soon.